Envirofill® 16/30 keeps your putting greens performing better longer. It’s durable, reusable, and with built-in Microban® technology, it’s resistant to stain-causing bacteria. Because it’s non-compacting, it will help your putting green perform its best year after year. Microban technology is built-in antimicrobial protection that gives products an added level of protection against microbes such as stain and odor causing bacteria. The perfect finishing touch. Envirofill 16/30 adds a realistic look to your putting green. The special blend of black and green mimics a natural surface, leaving everyone impressed. Consistent speed. Envirofill’s highly-rounded quartz core resists compaction so the green’s speed stays more consistent over the life of the green. Fights against mold and mildew. Microban antimicrobial protection is infused into Envirofill 16/30 during the manufacturing process to help prevent the growth of bacteria, mold, and mildew that can cause stains, odors, and product deterioration. Easy installation. Putting green turf can be very dense and difficult to infill. With its rounded shape, uniform size and smooth surface, Envirofill 16/30 quickly settles into the turf saving you time, effort and aggravation. Envirofill® 16/30 keeps your putting greens performing better longer. It’s durable, reusable, and with built-in Microban® technology, it’s resistant to stain-causing bacteria. Because it’s non-compacting, it will help your putting green perform its best year after year. Microban technology is built-in antimicrobial protection that gives products an added level of protection against microbes such as stain and odor causing bacteria. The perfect finishing touch. Envirofill 16/30 adds a realistic look to your putting green. The special blend of black and green mimics a natural surface, leaving everyone impressed. Consistent speed. Envirofill’s highly-rounded quartz core resists compaction so the green’s speed stays more consistent over the life of the green. Fights against mold and mildew. 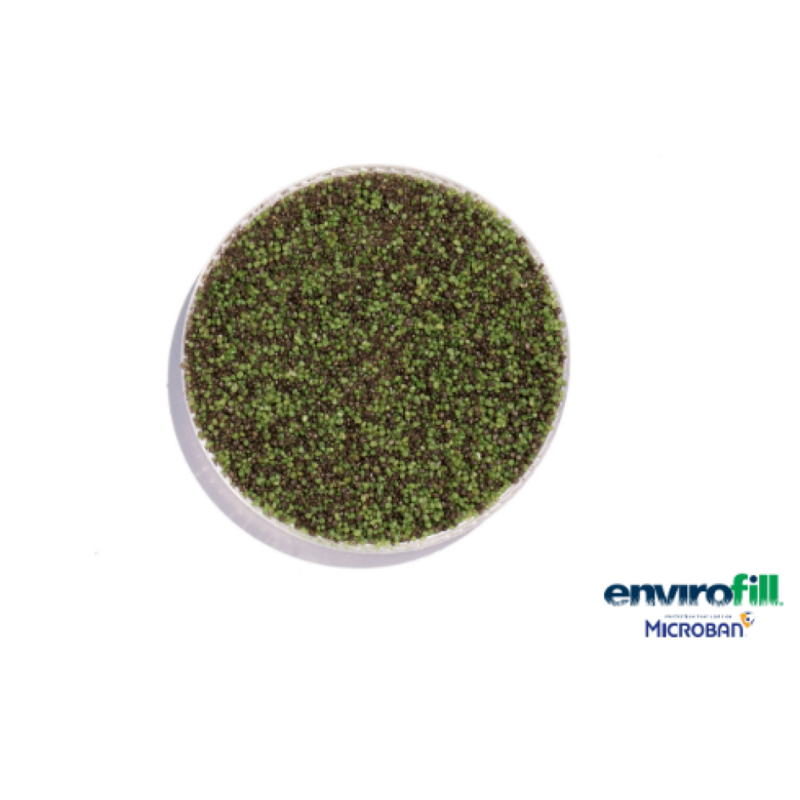 Microban antimicrobial protection is infused into Envirofill 16/30 during the manufacturing process to help prevent the growth of bacteria, mold, and mildew that can cause stains, odors, and product deterioration. Easy installation. Putting green turf can be very dense and difficult to infill. With its rounded shape, uniform size and smooth surface, Envirofill 16/30 quickly settles into the turf saving you time, effort and aggravation.